San Diego singer/songwriter Michael Tiernan’s song “L.A. Can Wait” was selected earlier this month from 16,000 entries from 115 countries as a finalist for the International Songwriting Competition. Judges Tom Waits, Jeff Beck, Kelly Clarkson, Tori Amos, Lucinda Williams, Keane, Robert Smith, Ozzy Osbourne and others will select the winning songs. Tiernan is a two time Los Angeles Award winner for Male Singer-Songwriter of the Year and Triple-A Album of the Year, International Acoustic Music Awards Male Artist of the Year Runner-Up and was a Great American Song Contest finalist. “L.A. Can Wait” is the title track from his fourth studio album. In early May the winners for each category of the songwriting competition will be announced. “Who knows what the judges will go for – there are a lot of strong songs in my category,” said Tiernan. “But, I hope as songwriters who have sacrificed to get where they are today, I’m hoping the judges will relate to the song, because that’s what the song is about – pursuing your dreams in your own way, never giving up, but adapting to life’s challenges and seeing them as gifts to help you along the way. Plus it would be incredible to win such a huge competition,” he continued. 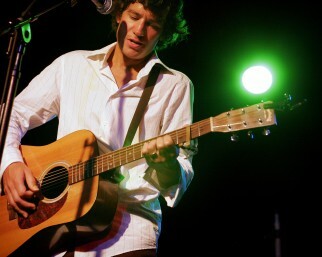 And it seems that Tiernan could be on a little winning streak – earlier this month, his song “Easy” from the same album won a top 5 award in the 2011 Great American Song Contest. And the month previous, he signed a licensing agreement with the Discovery Network to use songs from his last album in their programming, which is the world’s largest non-fiction network, including not only the Discovery Channel, but Oprah’s channel, TLC, The Animal Planet. “Who knows, my music might become the backdrop to animals doin’ it on the Discovery Channel! That’s why I got into music in the first place!”, jokes Tiernan. “L.A. Can Wait” is Tiernan’s 4th studio album and was produced by L.A.’s rising talent Andre de Santanna, who learned a lot of his production chops from multi-platinum producer, Roy Thomas Baker, and has production and performance credits with an array of top artists including Jason Mraz. Michael’s past three albums are all award-winners (two-time Los Angeles Award winner for Male Singer-Songwriter of the Year and Triple-A Album of the Year, International Acoustic Music Awards Male Artist of the Year Runner-Up, Great American Song Contest finalist). “L.A. Can Wait” is an album for both the goal-driven workaholic and the free-spirited contemplative. It takes you from the beach to the city, from the temple to the tavern, and leaves a little bit of your heart in each place.